You go to the contest entry site here. All amateur and professional photographers from all nations are welcome to submit work shot anywhere in the world. Your initial entry is $20 (one image). Each additional entry will be $10. Once your entry has been paid there are no refunds provided. Is there a theme for the competition? No, all images on any subject matter are eligible as long as they were shot after July 1, 2018. We do provide categories for guidance but there are not category winners. Yes, AI-AP does not retain any rights to your work when you make your submission. Upon selection, permission is given only for use in the book, website, finalists exhibit and any promotion for American Photography relevant to the contest. Proper artist credit is always given along with contact information where applicable. JPG files are required for submission. Upload files 72dpi, RGB, up to 1000 pixels on the LONGEST side, up to 20MB. Use any unique file name, but do not include special characters or spaces in the file name. Save file as a .jpg. Do I submit hi-res file? No. If selected, we will request hi-res files at minimum 300 dpi, 20x13", CMYK for reproduction. Can I edit my submission before I submit it and pay for it? Yes, the site will guide you in the submission process and will show you your entries. Before you submit and pay, you will be able to remove and resubmit images or add more images to your cart. Once you submit and pay however, it is not possible to remove or exchange images. Can I change an image after I've submitted it? Yes, you can until you pay and submit your images. Can I log back in and submit more work once I've checked out and paid? Yes, log in and you can view your entries and add more if you choose. Yes, once you've completed your submission, you will automatically receive an email confirmation that includes your member ID number with the amount paid. This will act as your receipt. What if I can't register or submit my images online? Please check that you do not have a firewall installed that is preventing access. You may also try to submit using a different computer from work or home. Contact info@ai-ap.com with any other technical problems. Winning entrants for our short list will be notified individually in Sept. by email with details on what is required for inclusion in the book and website. The ten finalists will be notified in early October. All entrants will be notified with the results and an announcement with a link presenting the winning images will be sent by email to everyone following the exhibit and event in New York City in late October. There will also be a posting in Pro Photo Daily and on all related social media. Can I register for your free Pro Photo Daily newletter? Yes, go back to the cfe page and enter your email address in the box provided to receive Pro Photo Daily. You may quickly unsubscribe for any reason at anytime. How do I contact American Photography if my question is not covered in this FAQ page? 1. Contest Overview: Contest Overview: Entry into this Contest is accomplished by submitting, in accordance with these terms and conditions, photos via our entry site HERE. The judges will award a Grand Prize of $5000 for the best single image and a Tamron SP 70-200 F/2.8 Di VC USD G2 lens, a SanDisk Extreme Portable SSD and a PhotoShelter 2 year Pro subscription, a Skylum Edit Suite and a Fujifilm X-T3 camera. Your first entry in the Competition is $20. Additional entries may be purchased at the time of your submission for $10 each. Entries must be submitted by August 31st, 2019. 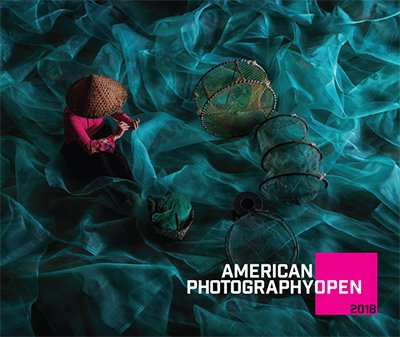 By entering the Competition, You agree and acknowledge that American Photography is permitted to receive your registration data and that any personal information will be used by American Photography solely for the promotion of the American Photography Open 2019 competition. 2. Eligibility: This Contest is open to Entrants of all ages, backgrounds and experience levels using whatever equipment, (phones to SLR's) to create your image. By participating in this Contest, Entrants: (a) agree to be bound by these Official Rules and by the interpretations of these Official Rules by American Photography, and by the decisions of American Photography, which are final in all matters relating to the Contest; (b) to release and hold harmless American Photography and its respective agents, employees, officers, directors, successors and assigns, from any and all liability, for loss, harm, damage, injury, cost or expense whatsoever including without limitation, property damage, personal injury and/or death which may occur in connection with, preparation for, travel to, or participation in the Contest, or possession, acceptance and/or use or misuse of a Prize or participation in any Contest-related activity and for any claims based on publicity rights, defamation or invasion of privacy, trespass, nuisance, misleading or deceptive conduct, passing off, infringement of intellectual property rights and merchandise delivery; and (c) acknowledge compliance with these Official Rules. 3. To Enter: To enter, you must upload your image HERE and follow the on-screen instructions carefully. Images must have been taken after July 1, 2018 and entries should be based on the Categories outlined, information on which can be found on the Website. Images should be no smaller ***than 1MB and no larger than 20MB. Images should be JPEG files. All images must be saved in the RGB color model. All entrants must be able to supply a high resolution image suitable for printing in exhibitions should the image be required. Judging will be based on the single images. American Photography recognizes you, the author of the image, and you retain full ownership of the copyright in each Entry. All entrants understand that any image submitted to the competition may be used by American Photography, and its Event Partners, for marketing and promotional purposes of You the author and the event only, for a maximum of three years after the awards ceremony in October 2019. You hereby grant American Photography a non-exclusive, irrevocable license in each Entry throughout the world for three years in all media for any use connected to the promotion of You the author and the American Photography awards event and/or competition, including, but not limited too: (a) judging the Competition (b) displaying the winning entries and runners up at public exhibitions promoting the American Photography Open 2019 competition (c) inclusion within the Website, and American Photography Awards book. (d) inclusion within any materials promoting of the Competition and / or any exhibition organized by American Photography in the promotion of the Competition (e) sub-licensing the Entries to the press for reproduction in connection with the Competition and any exhibition. All entrants understand that the image information, including image name and description, may be shared with Event partners and media. For the avoidance of doubt the “image information” does not include any personal information of You the author. Any photograph used by American Photography will carry a credit line. Any failure to provide such credit line shall not be deemed to be a breach, as long as American Photography uses its reasonable measures to rectify such failure within a reasonable period from the date of notice of such failure. By entering, all entrants warrant and represent that (a) their respective Submissions are their own 100% original creations; (b) their respective Submissions do not incorporate any intellectual property from any third parties (without appropriate releases); and (c) that their submissions do not violate any rights (including any rights of privacy, trespass, nuisance, misleading and deceptive conduct, passing off, rights of publicity or copyrights) of any third parties. (d) acknowledge that where applicable these Official Rules are a consent to use adaptation and publication for purposes. In the event of a dispute over who submitted a winning online entry, the authorized subscriber of the e-mail account used to participate in the Contest at the actual time of entry, will be deemed to be the entrant. The authorized account subscriber is defined as the natural person who is assigned an e-mail address by an Internet access provider, online service provider or other organization (e.g. business, education, institution, etc.) that is responsible for assigning e-mail addresses for the domain associated with the submitted e-mail address. 4. Prize Winners Selection/Notification: Entries will be judged between September 1 and 14, 2019. A shortlist of photographers will be selected and announced in September and will be available for Community Voting. American Photography will run an online rating process allowing members of the public to vote for their favorite photograph. If there is sufficient evidence (in American Photography’s sole discretion) to suggest malpractice and manipulation of the rating process, then American Photography has the right to remove the relevant Entry and, if necessary, award the prize to a different contestant. The ten finalists chosen by the judges and the Community winner will be announced in October in New York City where the Grand Prize winner will be announced, and in the Pro Photo Daily newsletter and web site. When you enter the competition your email is included in American Photography’s mailing list and they may retain those details in order to process your inquiries, manage your entry, send you newsletters and relevant information or respond to your requests and improve the Competition. American Photography may use your email address to communicate with you about the Competition and future competitions and provide administrative information if needed. 6. General Prize Terms: American Photography will cover the costs of shipping of prizes for winning entries if the Entrant is not present in New York City in October. Upon entry into the Contest each Prize Winner (as well as all other entrants) is required to comply with any and all applicable national/federal, state, and local laws, rules, and regulations. All federal, state and local taxes, and any other costs not specifically provided for in these Official Rules are solely the Prize Winner’s responsibility. American Photography shall have no responsibility or obligation to any Prize Winner or any potential Prize Winner who is unable or unavailable to accept or utilize the Prizes as described herein. No substitution, transfer or cash equivalent of the Prizes or any portion thereof is permitted, except American Photography, in its sole discretion, reserves the right to substitute a prize. The prize is non-transferable. 7. General Terms: Non compliance with any of these Official Rules may result in disqualification. ANY VIOLATION OF THESE OFFICIAL RULES BY A PRIZE WINNER OR ANY BEHAVIOR BY A PRIZE WINNER THAT WILL BRING SUCH PRIZE WINNER, AMERICAN PHOTOGRAPHY OR IT’S PARTNERS INTO DISREPUTE (IN AMERICAN PHOTOGRAPHY’S SOLE DISCRETION) WILL RESULT IN SUCH PRIZE WINNER’S DISQUALIFICATION AS A PRIZE WINNER OF THE CONTEST AND ALL PRIVILEGES AS A PRIZE WINNER WILL BE IMMEDIATELY TERMINATED. American Photography assumes no responsibility for incorrect or inaccurate entry information whether caused by any of the equipment or programming associated with or utilized in this Contest or by any human error which may occur in the processing of the entries in this Contest. American Photography is not responsible for any problems or technical malfunction of computer online systems, servers, or service providers, computer equipment, software, failure of any e-mail or on account of technical problems or traffic congestion on the Internet or at any web site, or any combination thereof, or any incomplete, lost, late, delayed, misdirected or garbled Submissions or failure to receive Submissions, including, without limitation, any injury or damage to participant’s or any other person’s computer related to or resulting from participation or downloading any materials or software or attempts to participate in or download materials or software related to this Contest. American Photography is not responsible for any typographical or other error in the printing of the offer, administration of the Contest, or in the announcement of the Prize Winners. If, for any reason, the Contest (including, but not limited to, any aspect of the online voting process) is not capable of running as planned, or is disrupted or corrupted, including, without limitation, strikes, acts of war or terrorism, infection by computer virus, bugs, denial of service attack, tampering, unauthorized intervention, fraud, technical or system failures, or any other causes beyond the control of American Photography which corrupts or affects the administration, security, fairness, integrity or proper conduct of this Contest or for any reason American Photography deems it necessary, American Photography reserves the right in its sole discretion to cancel, terminate, modify or suspend the Contest or to determine the Prize Winners in their sole discretion. Entrants agree to indemnify and hold harmless American Photography from any and all liability resulting or arising from the Contest, to release all rights to bring any claim, action or proceeding against American Photography, and hereby acknowledge that American Photography has neither made nor are in any manner responsible or liable for any warranty, representation or guarantee, express or implied, in fact or in law, relative to the Prizes, including express warranties provided exclusively by a prize supplier that are sent along with the Prizes.